Back in 1996 I was part of a team in charge of assessing the vulnerability of a major south Florida hospital to hurricanes. My specific responsibility was to characterize the potential impacts of hurricanes, and its various damaging components, on the facility located in the coastal region of Miami-Dade County and to identify and recommend specific mitigation measures to reduce the potential for damage to this facility from recurring hurricanes. In researching the possible impacts of storm surge on the campus of this facility I was soon confronted with the reality of sea level rise. All of the available site plans, land survey and plans showing ground floor elevations for the various buildings made reference to elevations above NGVD, which was a fixed mean sea level reference point established in 1929. My research of tide gauge data and other sources showed that mean sea level in 1996 at that specific location was already approximately 20 – 22 centimeters (~ 8″-9″) above NGVD, which meant all of those ground and ground floor elevations on the plans were that much lower with respect to mean sea level, and consequently more vulnerable to the impact of storm surge during hurricanes. A constant frustration as I became much more involved in all aspects related to climate change, global warming and sea level rise, has been the persistent reference by scientists to sea level rise in terms of a rate of rise of 1 mm, or 2 mm per year, and more recently 1″ (or 2.5 mm) per decade, which has usually led to yawns, rolled eyes and just plain lack of interest from various audiences. After all, 1 mm is more or less the thickness of a penny, so even when you stack-up 2 or even 3 pennies they do not amount to much. 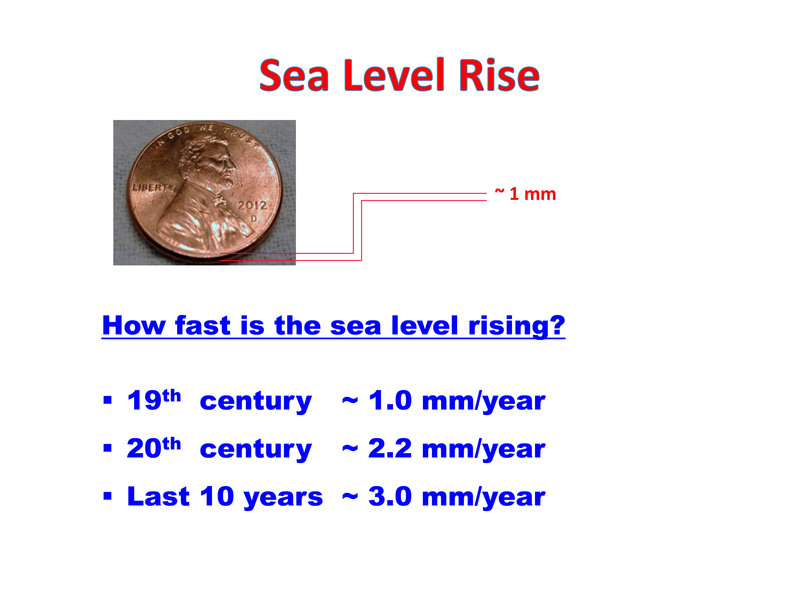 How can we pretend to convey the seriousness of the threat posed by sea level rise in those terms? I have found it to be much more effective to discuss sea level rise in terms of its horizontal component or what I call sea level run. 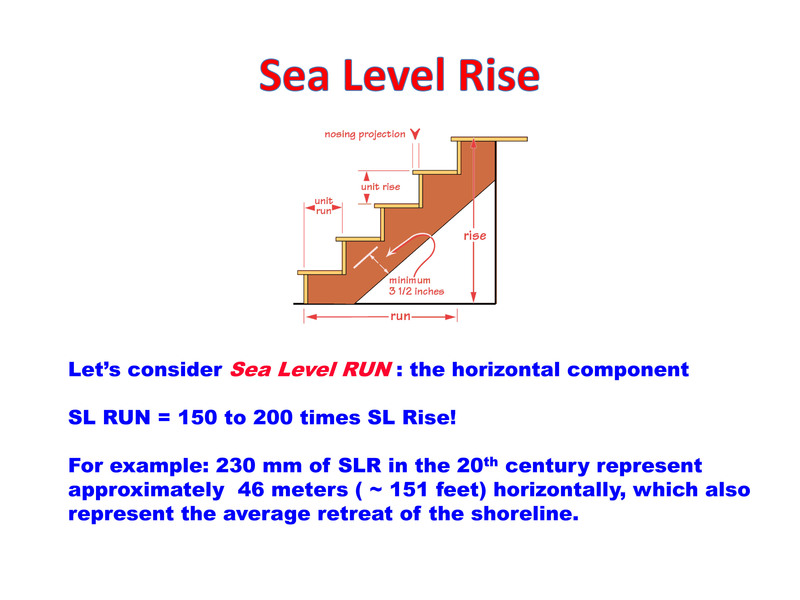 In considering this aspect of sea level rise it is useful to imagine a staircase. Each step in a staircase has a vertical dimension known as the rise and a horizontal dimension known as the tread or run. Most everyone will understand this analogy and find it quite logical that in order for a stair case to climb from one floor to another it must also travel a considerable horizontal distance. It is exactly the same for sea level rise. Sea level run is a function of the slope of the beach and coastal region at a given region, but in general terms and considering the very low and gentle change in elevation prevalent in Southeast Florida, it is estimated that sea level run in this coastal region may range from 150 to 200 times the rise. Viewed in these terms, suddenly 3 mm is equivalent to 3 x 200 = 600 mm (approximately 2 feet) of shoreline retreat per year and a new perspective takes over when considering the potential for damage from this hazard. Things become even clearer when one considers how sea level rise and sea level run have been and will continue to exacerbate storm surge for the foreseeable future gradually transforming it into a much deeper, faster flowing, much more damaging hazard that also results in higher waves and vastly stronger energy of impact against buildings in its path. To address what sea level rise is, what causes it, how fast it is occurring, how it will affect us, and what can we do about it? This past 5 March 2013 I gave a conference on Sea Level Rise: Can we keep the sea away? at the St. Gregory’s Episcopal Church in Boca Raton, Florida. The slides I used to illustrate my conference are now posted on this site. Please go to the CONFERENCES-PRESENTATIONS on the banner menu above and look for Sea Level Rise Conference – 5 March 2013, Boca Raton, Florida.